Digital prescribing support resources developed by the University of Liverpool to help optimise treatment for HIV patients worldwide have won a national medical research award. The British Medical Association (BMA) MEDFASH Prize is awarded in recognition of work that improves the quality of HIV and sexual healthcare in the UK. This year the Liverpool Drug Interactions team was selected as the winner of the Prize for its world leading HIV Drug Interactions resources. Developed and maintained by researchers at the University’s Institute of Translational Medicine, http://www.hiv-druginteractions.org and companion app HIV iChart provide comprehensive, clinically-useful, evidence-based, drug interaction resources, which are freely available to healthcare workers, patients and researchers across the globe. The resource is recommended as a key patient management tool in multiple national, regional and international treatment guidelines, including those published by the British HIV Association, European AIDS Clinical Society and the World Health Organisation. While advances in therapy have yielded effective treatments, the drugs used to treat HIV are amongst the most therapeutically risky for drug-drug interactions (DDIs) which can cause significant patient harms. Many drug combinations have the potential to interact and this can affect patient safety or the effectiveness of treatment. For this reason, some drug combinations should not be given at all, while other drugs may be used together with caution. Managing potential drug interactions is an essential part of HIV clinical management and prescribers need access to regularly updated, evidence-based information in order to manage these treatment complexities safely and effectively. The Liverpool applications and websites provide a guide to interactions that may occur between different HIV drugs and over 700 commonly prescribed co-medications, as well as recreational drugs and herbals. The resources are constantly updated to reflect the latest research and safety data and respond to over 300,000 interaction queries from over 20,000 users each month. Katie McAllister, Development Manager, Molecular and Clinical Pharmacology, University of Liverpool, said: “Just a few months after Liverpool pharmacologists we awarded the Queens Anniversary Prize and were shortlisted for The British Medical Journal Awards, the University has again been recognised for our HIV pharmacological research by being selected as the recipient of this year’s BMA MEDFASH Prize. 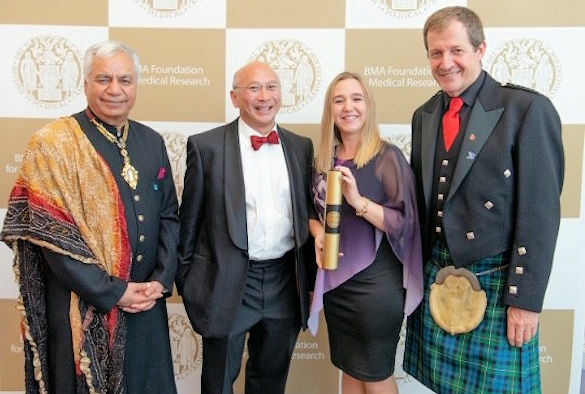 Through the BMA Foundation, the BMA has been supporting medical research since 1839 and is the oldest medical organisation in the world to award grants and prizes to encourage further medical research. Thanks to the support of generous individuals, in 2018 eleven research grants totalling £575,000 will be awarded to winning applicants. The grants provide funding for a variety of different subject areas, ranging from research into rheumatism and arthritis, to cardiovascular disease, cancer and neurological disorders. This year’s prestigious awards ceremony was held last night [Tuesday, 6 November] at BMA House in central London and was presented by BMA President, Professor Dinesh Bhugra CBE. For more information on how you can help to keep HIV drug interactions and its associated app HIV iChart up-to-date, comprehensive and freely available worldwide please click here.